In our quest to find the very best hybrid mattresses, we’ve stumbled upon the Avocado Green bed. What first caught our attention was the intelligent combination between Dunlop latex and a generous layer of innerspring coils. This combination leads to a very durable, yet supportive mattress, but there is so much more to the Avocado than that. 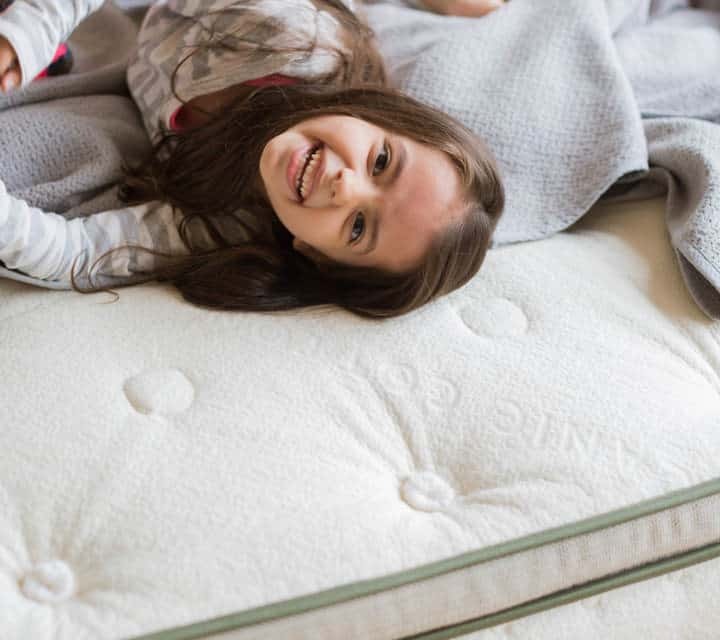 There’s a world of benefits that opens up when you look at the advantages that each material within a hybrid mattress brings to the table, so we felt compelled to give credit where it’s due. One of the many reasons why people purchase the Avocado Green mattress is the organic blend of materials that are used in its construction. Straight from the cover, we’ve noticed a blend of New Zealand wool and certified organic cotton, that creates a natural and soft protection for the Avocado Green Mattress. Each of these two materials has a unique set of features. The wool was added to the cover because of its moisture wicking properties, but also because it acts as a natural fire barrier. The material is anti-microbial and repels dust mites. On the other hand, we have the organic cotton, that adds softness and breathability to the mattress. Pillow top available for purchase. Excellent support for back and stomach sleepers. Top cover features quality materials and stitching. Ideal for people who want a bouncy mattress. Handcrafted buttons on the cover are noticeable in certain pressure points. Twin size, measuring 38 x 74 x 11 inches, with a total weight of 80 pounds. Twin XL size, measuring 38 x 80 x 11 inches, with a total weight of 87 pounds. Full size, measuring 54 x 74 x 11 inches, with a total weight of 111 pounds. Queen size, measuring 60 x 80 x 11 inches, with a total weight of 132 pounds. King size, measuring 76 x 80 x 11 inches, with a total weight of 167 pounds. Cal King size, measuring 72 x 84 x 11 inches, with a total weight of 166 pounds. There’s a lot of hype surrounding this vegan mattress, but it all boils down to how the construction of the bed puts those layers to work together in order to provide comfort and relief for the sleeper. Without further ado, let’s see what the Avocado Green mattress is made of. When you first meet a mattress, the cover is the first one to leave an impression. As far as the Avocado Green mattress is concerned, everything about the top cover screams organic. It’s pretty clear that this, not your average mattress. There are handcrafted tufts that add durability to the product. The organic cotton cover holds the entire structure of the mattress together with the help of wool yarn rosettes. On the bottom side of the mattress, you can see the anchors that secure the yarn. Underneath the cover of a mattress, you will always find the comfort zone, which is made either from a singular or a mix of multiple layers that are meant to provide the sleeper with added comfort and pressure point relief. The Avocado Green mattress has a two-inch layer made with natural Dunlop latex. There are a lot of great things brought to the table by this choice of material for the comfort zone. First off, latex is bouncy, which not only gives you that traditional mattress feels, but also makes movement a lot easier when you find yourself switching between sleeping positions throughout the night. Moving forward, we have eight inches of innerspring units that are divided into three levels of firmness across the surface of the mattress (we’ll get back to that in the next section). Made from recycled steel, this is the support layer of the mattress. Since the coils are individually wrapped, there is a lot of airflows permitted within the core of the mattress, adding more points to the breathability factor of the bed. That and the latex layer will ensure that you never have to suffer from overheating as you sleep. At the base of the mattress, we find one extra protection layer that’s made out of 100% natural Dunlop latex. For a couple of hundred bucks extra, you can throw in the optional pillow top that adds more cushioning to the Avocado Green mattress. The European-style pillow top brings an additional two-inch layer of natural latex, making the mattress now measure 13 inches in height. This brings some changes to the comfort layer of the mattress. If you opt for the pillow top model, your mattress will have a Dunlop latex layer that’s divided into three sections, each with its own firmness level. So, we have two inches of soft latex and another two of medium latex. To top it off, there’s also a one-inch layer of medium firm latex in the bottom part. To better understand how this affects the firmness of the mattress, we can take a look at the indentation load reflection for each of these materials. A rating of 12 will reveal a very soft material, while something closer to 50 indicates a firmer one. With these rules in mind, the first layer has an ILD or 14 to 19, which rates it as being on the softer side, while the next two inches have an ILD of 26 to 31, falling under the medium category. By now, you already know that each individual will feel the firmness of a mattress differently. But we’re here to help you form an opinion on what the Avocado Green mattress has to offer in terms of firmness. Imagine applying hand pressure on top of the mattress and feeling the soft combination between cotton and wool that’s blended into the cover. Pushing even further, you will feel the latex layer that works together with the pocketed coils to give the mattress bounce and support. Tests have revealed that the Avocado Green mattress has a firmness rating of about 7 out of a total 10, being quite a firm bed. Despite its firmness, the quilted top and the latex layer provide a decent level of comfort, as you’ll come to understand from our pressure point analysis. 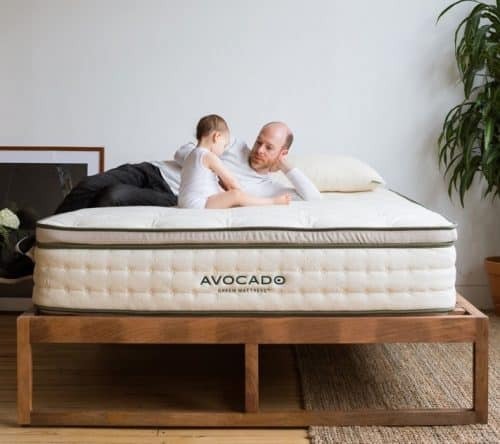 Another important thing to discuss here is how Avocado divided the surface of the mattress into three different firmness regions, to support each part of the body as it should be supported. The pelvic and the shoulder area is softer, while the lumbar area is firmer. Why these three zones, in particular, you ask? That’s because they are the hardest to accommodate. The pelvic area is known for carrying the most weight, which means that the added support by making this zone firmer is a nice touch. The feel of the mattress is best determined by analyzing how the body feels in all three common sleeping positions. Lying on your back on the Avocado Green mattress, you will first feel the softness of the cover. The latex layer underneath it does a very good job in filling in the gap that’s normally created in the lower back area when sleeping in this position. There are no noticeable pressure points that could cause a disturbance, which is pretty much what you would expect from a mattress of the firmness level of the Avocado Green. Due to the bounciness provided by the latex and innerspring combination, you will find it very easy to roll over to your side. Speaking of side sleeping, we were very curious to analyze the pressure points created on this side, since the mattress is pretty firm. There is a little bit of pressure noticeable in the shoulders and hips areas, and especially in the head zone. That shouldn’t be a problem since side sleepers will choose a pillow with a suitable firmness to support their head and keep their body aligned in a position that’s good for the spine. Tests indicate that this mattress may be good for side sleepers, but only those who have enough body weight to trigger the benefits of the comfort latex layer. Otherwise, you may feel like you’re not sinking into the mattress as you should. While sleeping on the stomach isn’t recommended, as it put a lot of pressure on your neck that’s forced when having to turn your head to the side, there are people who find this position extremely comfortable. This position is also very pretentious in terms of body alignment, which also left us very curious if the Avocado Green can do a good job in supporting a stomach sleeper. By lying on your stomach, you can feel how the bouncy latex pushed your hips upwards, without putting to much pressure on your chest area. That means that you can comfortably breathe when sleeping on your stomach on the Avocado Green mattress and won’t have to worry about unnatural spine bending. Our conclusion? 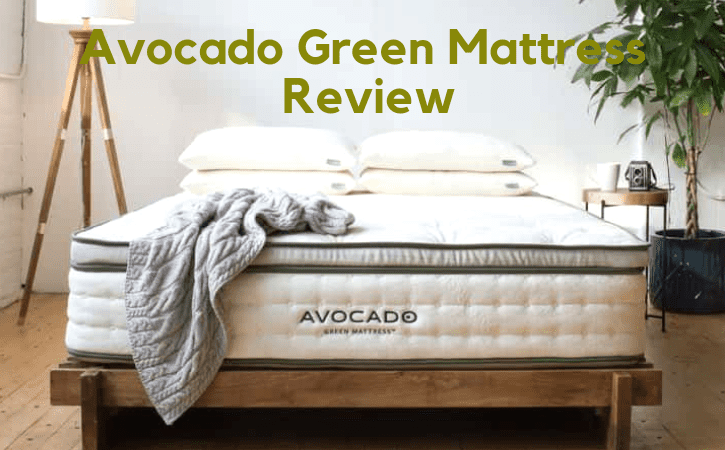 The Avocado Green mattress is a really good choice, offering a lot of support for back and stomach sleepers, but also has the potential to support some side sleepers, as well. When we examine the edge support of the mattress, that are two main things that draw our attention: the level of compression felt as you sleep closer to the edge of the bed and the compression experienced when you sit on the edge. The first one is important because you want to be able to roll to the edge of the mattress without too much compression, eliminating the feeling that you’ll soon fall off the bed. The edge support of the Avocado Green mattress is exceptional, mainly because innerspring mattresses with individually wrapped coils do a great job in supporting the body, even as you’re lying close to the edge. There is very little compression when we sleep on the edge of the bed, which means that you can fully enjoy all parts of your Avocado Green Mattress. Obviously, there is a bit more compression felt when you sit on the edge of the bed, but it’s neglectable, further proving that this mattress does a great job at this chapter. Motion transfer is super important when you’re sharing your bed with a sleeping partner. You want to both be able to move around freely and switch sleeping positions without triggering a domino effect inside the different layers of the mattress and having your movements disturb the other. Typically, a spring mattress would cause a lot of motion transfer, but when you have a mattress with individually wrapped coils, the situation is quite the opposite. Because of the way this layer is constructed, a particular set of coils will only bend under your body’s pressure, without “disturbing” the other coils around it. This eliminates the domino effect and minimizes motion transfer. While not the most generous trial period we’ve seen, Avocado does offer its customers the chance to test the product for 100 nights before determining if it suits their needs. As for the warranty period, you get a generous 25 years. You should remember that the warranty does not cover any normal wear and tear, which includes the softening of the product that normally occurs as you use the mattress. 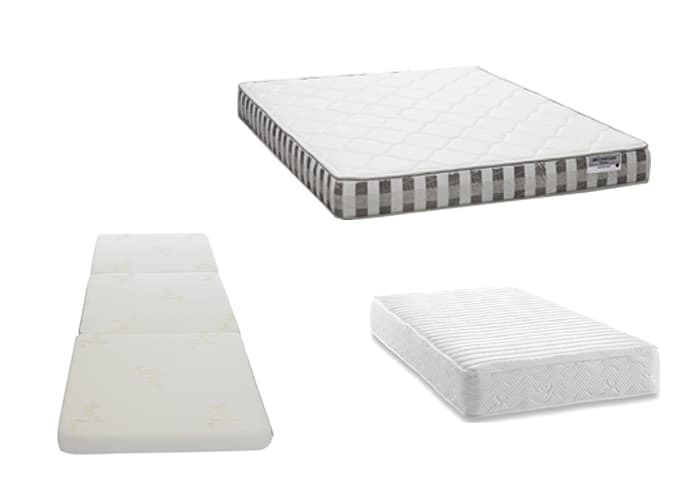 Of course, every time we review a mattress, we ask ourselves “who is this product for?”. First off, the Avocado Green is a bed for people who want a hybrid mattress. There are benefits to having an innerspring bed but also benefits to having a latex one. A hybrid mattress will allow you to get the best of both, without having to think about what you’re leaving behind. Second, this is a mattress for people who are in love with eco-friendly products. The Avocado Green mattress is made with natural, organic and recycled materials (it wouldn’t be called the “Avocado Green” otherwise). 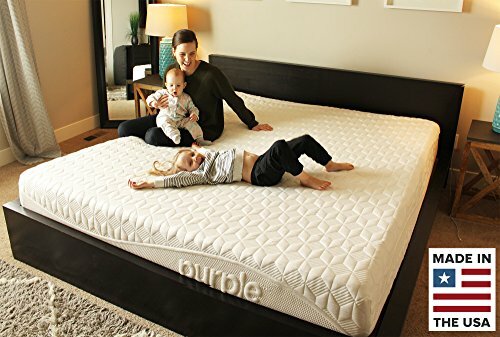 It’s also a mattress for people who prefer the traditional bounce of a bed, as the latex and the coil layers have a very quick response to pressure. Remember that this mattress falls on the firmer side, so if you are a lightweight side sleeper, this might not be the product for you. Thankfully, the manufacturer provides a 100 nights free sleep trial, so you will actually have the chance to test the bed yourself and see how it performs. Everyone who purchased the Avocado Green mattress can agree that their customer service is impeccable. They will answer every question you need to know, even prior to purchasing the mattress, so you can have all the information at hand before spending money. When the buyer understands how the different materials of a mattress work together in its overall construction, there are little surprises related to the firmness level of the bed. 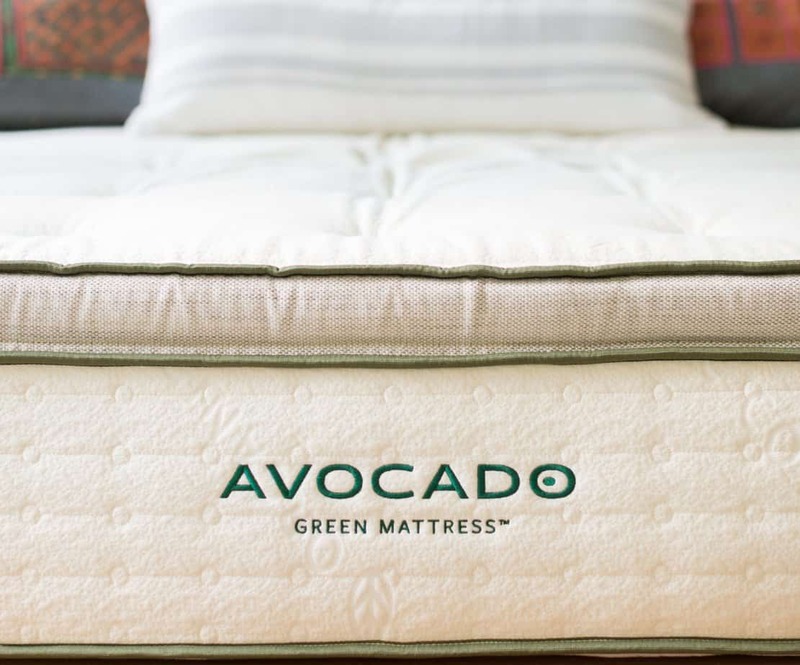 As far as the Avocado Green mattress is concerned, customers claim they got what they paid for: which is a firm mattress that supports back and stomach sleepers. Not a single customer that has purchased the additional pillow top has regretted the decision. The extra cushioning and the comfort provided by the additional layers of latex add a lot of support for people who like a plushier mattress. 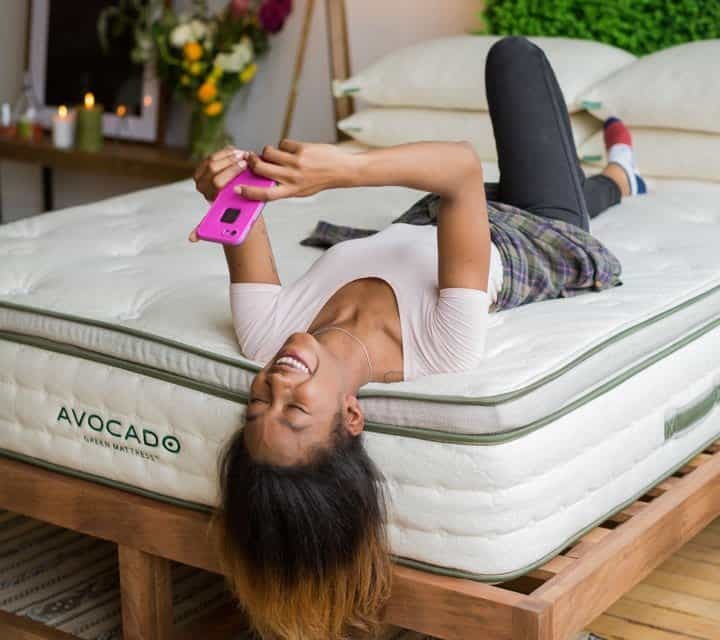 There is just so much we admire about the way the Avocado Green mattress was designed and constructed. The hand-tufted rosettes are the first thing that catches the eye, as they are made from New Zealand wool and have a high functionality: their primary role is to add durability to the mattress by acting as anchors pulling yarn throughout the entire mattress. This technique helps prevent the use of chemical adhesives, further vouching for the natural state of the mattress. The eight-inch coil system contains between 756 and 1,414 coils (depending on the size chosen) that are individually-wrapped to create a breathable, bouncy, durable and supporting the mattress. The coils are made from recycled steel and are divided into three different zones that are encased in a reinforced perimeter. Aside from this being a durability measure, it also helps minimize motion transfer. The sides of the mattress have heavy-duty handles that allow you to easily maneuver the mattress when needed, even if the mattress does not require flipping. 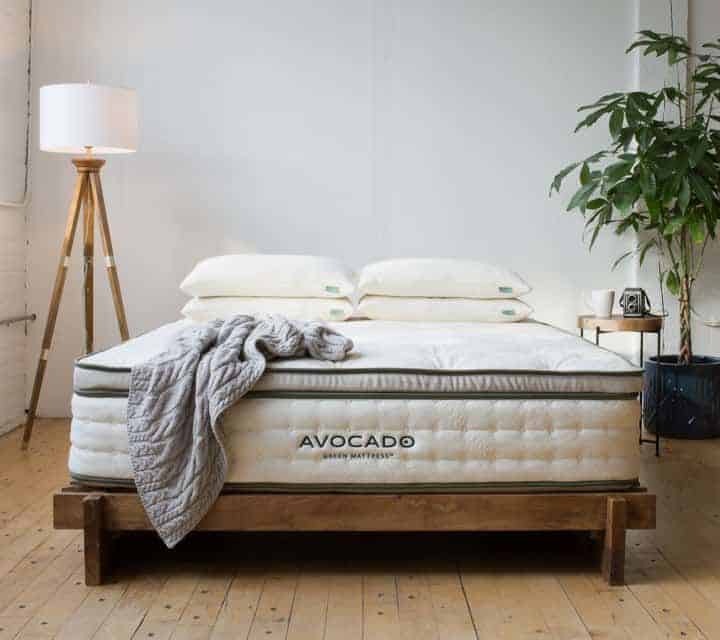 Being one of the greenest mattresses we’ve seen, it’s clear that the Avocado is destined not just for people who like eco-friendly products, but also for those suffering from allergies or concerned with the use of chemicals in their beds. 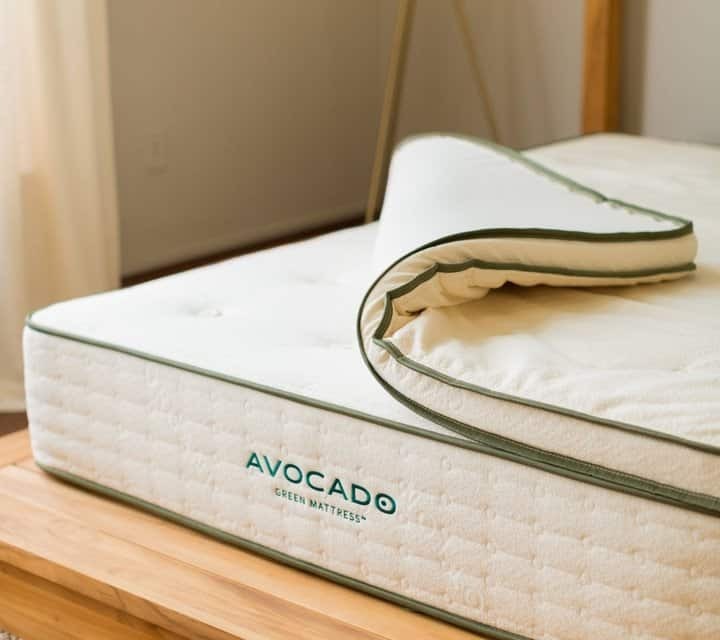 The Avocado Green mattress is safe, non-toxic, doesn’t use any chemical fire retardants, is free from VOCs and basically, a dream come true for every sleeper who is terrified of chemical-related abbreviations.